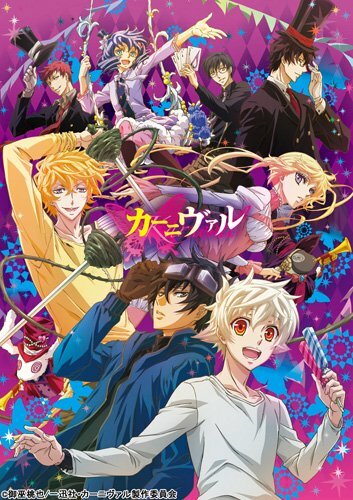 Watch Karneval full episodes online English Sub. Synopsis: While in search of his precious friend, a young boy named Nai falls captive to a beautiful woman, whose looks are matched only by her taste for human flesh. Meanwhile Gareki, a clever thief, is in the midst of robbing her luxurious home. After causing a distraction, Gareki agrees to help Nai escape, but they are discovered upon the woman’s return. As she transforms into a ghoulish monster, the boys flee. On the run, Nai and Gareki are found by “Circus,” a government defense agency that deals with criminal activity too difficult for the police to handle and protects civilians from “varuga”—terrible monsters that devour humans for sustenance. In the hope that it will lead Nai to his missing friend, he and Gareki decide to join Circus. On their perilous journey, they face dangerous varuga and begin to uncover the secrets behind a shadowy organization known as Kafka.